Below are two of the six films that were produced. The makers were a mini bus of young people from Cornwall, a groups from Connexions (Bristol), and a few young people who came along having seen the publicity. (They are all creadited on the films). You can view all the films by clicking here. Films for mobile phones itself as a genre and the part it can play/is playing in community media is something I’ll surely come back to at some stage. For now, i’ll just celebrate their achivements. Enjoy! Yesterday’s event was excellent and a real credit to Sam Burkey and all who helped organise it from Calling the Shots, Knowle West Media Centre, Suited and Booted and Firstborn Creatives, and all the young people who made the final decisions. At various times I was on the script surgeries table – giving advice to people on their film ideas, overseeing the library archive screenings and on the welcome table. During the script surgeries I met a lovely guy from Knowle West called Michael, who had the fascinating idea of making an animation/live action mixed film about a human and a fox. (I won’t give his storyline away here, but it is very good.) I would be keen to see how his film progresses as it had masses of potential. He is linked with the Media Centre, which is a good thing. For anyone to be given the support (no matter how formal or informal) in creatively expressing themselves I feel is a fundamental role of arts & media in society, and one I feel is grossly overlooked or not greatly valued. Arts in many ancient African, Native American and Aboriginal societies were part and parcel of the fabric of the community, not separate from religion, family, rites of passage and the general sense of identity. Artists didn’t sign their names on their works as they made them for the whole community, not for themselves, but still, the artist was held in high esteem, as his/her role was serving the community. In today’s climate the artist is vilified, as no one understands the art and why it is being made. I can defend conceptual art as I (think I) understand it’s place on the wide spectrum of the arts, but there is no doubt there is now a wide gap between the arts produced and the communities within which the artists may live. 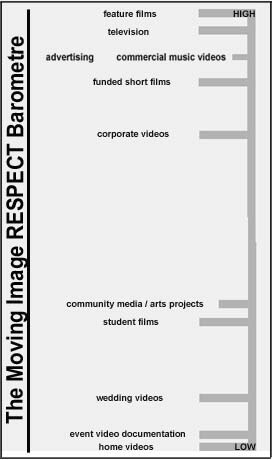 I would say though to those vocal haters of ‘modern art’ who have some money to spare – to save your ranting energy and instead support initiatives where you see the arts doing actual good in communities, (such as Fresh Film for example!!!). The advance of digital technologies in ‘developed’ countries is seeing a convergence in arts/media and mainstream services, with proven impacts on education, health, and other vital areas of society. Harnessing and pushing the boundaries of how these new technologies are used – and much more importantly, widening the access of them – is a dynamic way of connecting these strands together for the common aim of serving all. Last years went really well. I hope it has a good turn out today. Yesterday Firstborn and Calling the Shots ran a practical session on making films for mobile phones, which I hear went reallty well. Unfortunately I had 24hour man-flu so was too ill to attend! On Tuesday Knowle West Media Centre screened a documentary about Tricky – the Trip Hop artist who is originally from that area. He was there to answer questions with the Director of the film. Films being screened in the festival are a mixture of professional film & tv work, and work made by young people and facilitated projects. It’s good to have an outlet for this work, as there’s so much of it. It also rhymes with the context of my research as it’s called ‘Beyond Project’ – interested in what happnes when the projects are over. What happens to the work, the young people, the facilitators, the ideas generated, etc, etc? What impact did it all have? · effectiveness of web based projects. Of course many of these overlap. I personally like the idea of the 6 monthly magazine, and the national community media archive/database. Am I overestimating though the readership/users for this type of material? I’ll come back from time to time to discuss each of these in detail, and see if any of them are viable ideas. One – The means of exhibition of this type of work has been completely reversed and revolutionised by sites such as YouTube and MySpace, etc, which has awoken a curiosity in the web public to see what home video makers are making. Two – With the rise of such sites, home video makers have begun to produce work which fits the form of those platforms, thus giving birth to new genres in the process. Contrary to popular believe I don’t believe the shift from ‘home video’ to ‘user-generated content’ is not down to the advances in technological hardware such as camera phones, etc, as they have been with us for years now. The shift is due to technological software that can give exposure to the products of those hardware technologies. So where does Community Media sit within this new media landscape? That is something to be explored. This is how I saw the moving image hierarchy landscape 2 years ago. No doubt that part of what makes us human is the social interaction with others, but it has been long said that the internet have changed these dynamics forever. If a school, youth club or individual can make work in an afternoon and instantly show it to the world, will they still be inclined to employ a production company to do assist them in that process? And if I’m asking that question today, what is likely to be the reality in 5 – 10 years time? Will community media companies become the second hand bookshops of the future? (Still in the shadow of the mass media battered Waterstones, with the online Amazon taking the major share of the lead). [i] On the subject of the phrase ‘user-generated content’, I need to remember to trace who originally coined the term. and Mothercare, and not just the media companies. [iv] Also Al Gore has partnered with BSkyB to launch the UK version of its user-generated tv channel Current TV, which launched its US parent a year ago. In publishing, http://www.lulu.com allows you to upload your own manuscripts and print & sell them one at a time, taking the frustrations and risks away from mainstream publishing, and bringing it closer to DIY community publishing, allowing you to make a profit at the same time. [v] This article may be overly dramatic and pessimistic, but I think still a valid discussion point.